This sabbatical trip harbors serendipity at its core. We wanted to see where the year would take us and, although we had a travel itinerary, we wanted to leave ourselves open for a change of plans when something piqued our interest. My brother told me about the ferry to Cape May from Lewes Delaware and, since we had not taken the RV on a ferry up to this point, it seemed like as good a time as any. From the ferry, we could see the lighthouse in Cape May and decided to explore it when we arrived. So, after finding our campground, we headed for the lighthouse on the point. Along the way, we saw a sign for a winery tour. Hmmm. I don't remember a winery on Cape May. My curiosity was piqued, and we turned down the side road and pulled into the gravel driveway to see a large, wooden building overgrown with greenery. Lovely in the early afternoon sunlight, the winery offered an inviting diversion. We found ourselves in a large room with a chandelier made from a tangle of grapevine. On the opposite side of the room was an expanse of French doors opening out onto a terrace overlooking the vineyard. Our host explained our options for tastings and offered multiple places around the winery to enjoy our selections. How refreshing to be able to wander about the property instead of standing in a tasting room! It was a lovely day and we gladly took our little wooden rack of glasses outdoors. The late summer sun created a dappled light on the terrace and the view before us was serene. We could hear music from the cafe on the other side of the building, and muffled conversations from the deck above us. At the edge of the terrace was a path leading to a barn and the grapevines stretched out before us in neat rows. A stack of old wine barrels formed the end wall of the terrace and the other end was draped in green vines crawling up a trellis. The boundary paths were covered in loose pebbles that 'crunched' underfoot. A sound reminiscent of the loose shell and stone driveways at the beach house. A dozen photographs later we headed for the gift shop to purchase a few "souvenir" bottles before continuing our journey to the lighthouse. Not experts in wines, we simply enjoy visiting wineries for their beautiful landscapes and the opportunity to taste and learn about different wines. What we learned from the owners at this winery is that the vineyard covers 70 acres and they grow eleven grape varietals. Their primary focus is on the viniferous grapes including Cabernet Sauvignon (one of my favs! ), Cabernet Franc, Merlot, Pinot Grigio, Riesling, and Chardonnay (my other fav). Their signature white is a Chardonnay fermented and then aged in French Oak for over 16 months. It is a lovely wine and I added a bottle to our "souvenir" basket at the gift shop. 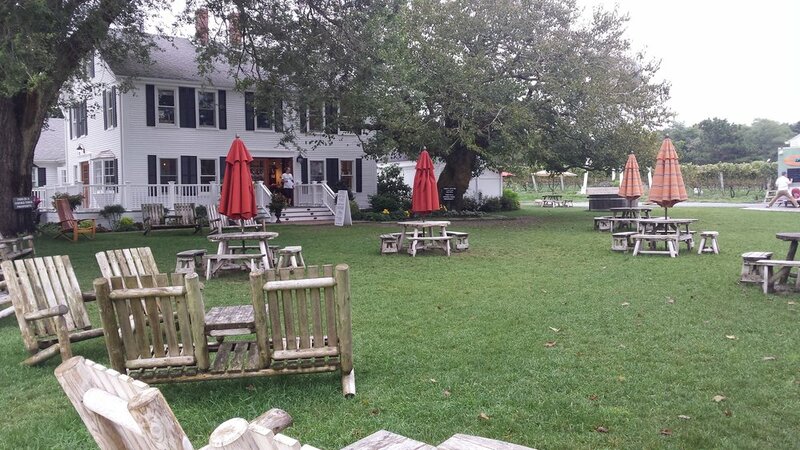 Cape May Winery was a lovely stop and a great start to our Cape May visit. Our second winery on this sabbatical trip took us to Cape Cod. 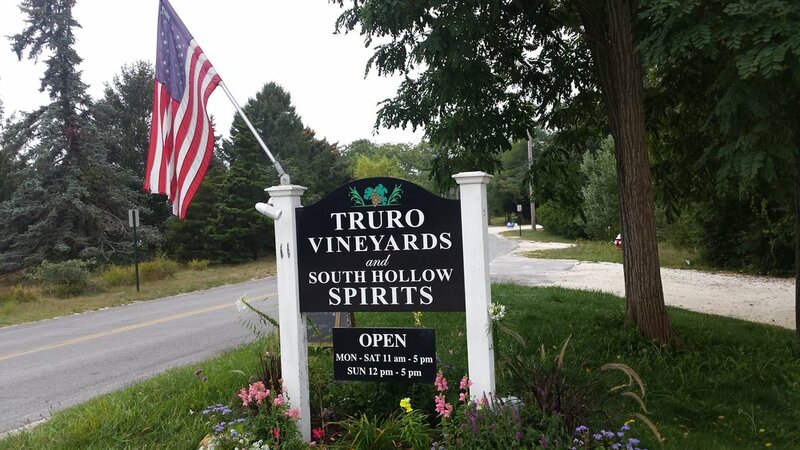 Driving out to Provincetown took us by a small winery perched on a rise just off the roadside. We made a mental note to visit before we left the Cape. A few days later when an Atlantic hurricane threatened our trip, we had to cut short our Cape Cod tour, but not before making a quick stop at this quaint roadside vineyard. Truro Winery tours are scheduled rather than on demand and we had to wait about half an hour before entering the tasting room. So, we wandered around the property and discovered something special about this little winery. Its restored 1830's farmhouse and stark white barns were picturesque contrasted against green lawns littered with small tables and chairs. A white clapboard shed offered drinks while a food truck prepared for the lunch crowd. 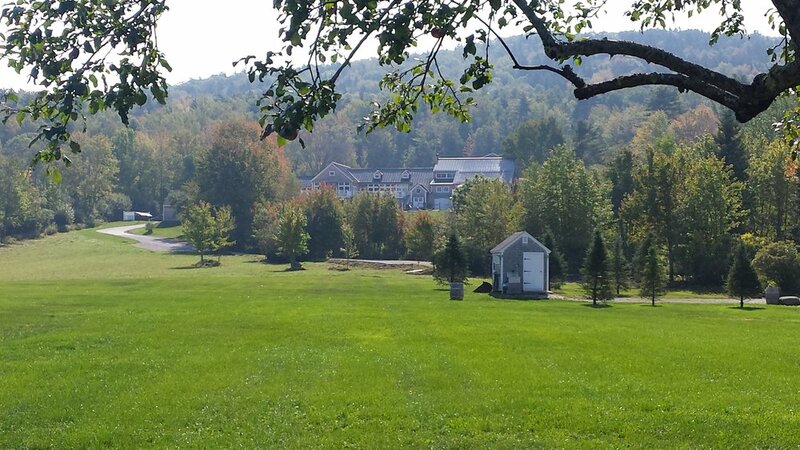 Walking across the lawns towards the barns we could see a sign that didn't carry the winery logo. It read, "South Hollow Spirits". Curiously enough, the winery also distills its own gin and rum! We learned that the vineyard was established in 1991 and is the sole vinifera vineyard in the region, pioneering the art of maritime grape growing on the Cape. On their five-acre farm, they grow Chardonnay, Cabernet Franc, and Merlot grapes. To supplement their vineyard production they source additional grapes from vineyards in Massachusetts, New York, and California, maintaining a hand-crafted character to their wines. The distillery, dedicated to the 19th-century bootleggers of Cape Cod, produces small-batch rum and gin in a 250-gallon copper pot still. The gin is made from local Eastern Red Cedar tree's juniper berries and organic angelica root. The rum, made with molasses and/or sugar cane, comes in several varieties each made in small batches. They offer a white, a spiced, and an amber rum as well as a white port-finish reserve and a red port-finish reserve. It seems they have brought the handcrafted vintner's touch to spirit making! Our tasting was conducted on a brick patio under a wooden pergola. Though our tasting hostess seemed to be slightly bored with the whole thing, the wines were pretty tasty. We stopped in at the gift shop but instead of a wine souvenir, we picked up a small bottle of the South Hollow Spirit's Dry Line Gin. We learned the name comes from a term designating atmospheric territories. We think they have carved out an interesting territory between wines and spirits! After a wonderful day of hiking at Acadia National Park, Maine, we decided to end our trip the following day with a visit to a Maine winery. A little research turned up a winery close to nearby Lincolnville. The day was sunny and warm, unseasonably warm this late in September, but welcome nonetheless. Our drive took us along winding country roads past forests full of trees wearing just a hint of fall color. A few turns and what seemed like many miles brought us to the 200-year-old barn that housed the Cellar Door Winery. We had gotten an early start anticipating a weekend crowd so we arrived at the winery early - it had not yet opened. The day's tours and tastings would not begin for another fifteen or twenty minutes so we sat in the morning sun, enjoying a high elevation view of the vineyard below. We could see workers draping white netting over some of the vines, while rows and rows stood green and uncovered. Curious. I would have to ask the tour host about that. The main building is quite modern inside. More of what I would expect to find in an urban area and, in fact, I learned that the winery has an urban tasting room in Portland. The same modern chic of the city tasting room carries over to this country-cousin. A long bar with leather barstools framed either side of the narrow room and expansive windows made it feel bright and airy. Beyond, we could see a formal dining area. Our host explained that the owners had decided to make the winery an event facility as well. What a beautiful setting for a wedding. It was really too early to start tasting wines, so instead, we asked about the growing process and our host invited us to walk the vineyards to watch the field hands work the vines. We asked about the white netting and were told that it keeps the birds off the fruit. Since it was just down the mill, we made the five-minute drive down into the valley and parked on the roadside. It was warm and we could hear birds, bees, and workers calling out to each other. There were a few trees to the side of the vineyards with several Adirondack chairs set in the shade. Taking advantage of the spot, we sat to watch the workers move from one row to the next, draping the white netting as they went along. There were no other visitors around, and the quiet setting was a welcome change from our busy day among the throngs at Acadia National Park the day before. Just before lunch, we made our way back to the winery for a tasting. To the right of the modern event space is a more casual tasting room. Our host told the story of the winemaking process and how wines from all over were brought to the winery to be blended into their award-winning wines. The five and a half acre vineyard grows cold-hardy hybrids developed to meet the challenges of Maine's weather. The Cellar Door Winery offers twenty different wines, many of them sporting awards. We enjoyed a few sips of several varieties and settled on purchasing a bottle of an estate wine, Blanc de Blanc, that was made in the traditional bottle fermentation method from grapes grown in this vineyard. Seemed like a fitting souvenir and something to help us celebrate the final weeks of our sabbatical. As we made our way south, we decided to visit the Baseball Hall of Fame in Cooperstown, New York. The route home from there would take us close to the Finger Lakes Region. The area boasts over 120 wineries and choosing a few to visit is a matter of geography and taste. Since we were staying at a campground on Keuka Lake we limited our search to that area, but there were still so many from which to choose that we needed a guide to navigate the choices. We settled on four wineries within a ten- minute drive of our campground. One featured a cream sherry, which seems an unusual offering from my limited winery experience, so we made sure to add that one to the tour. We narrowed it down further by limiting ourselves to three wineries since we were more interested in the lake views than the wine. It just isn't a good idea to do a bunch of wine tastings and then drive, so we chose wineries with interesting landscapes or products intending to simply purchase a bottle at each to add to our "souvenir" stash, enjoy walking the property and then open a bottle when we returned to the campground. The plan worked just fine. It was an overcast and blustery October day, so the vineyard tours were brief. We lingered at the last winery on our list tasting cheeses that were paired with particular wines and ended up purchasing the cheeses, and the wine that paired with them, for our later enjoyment. By late afternoon we had found several interesting wines including a Chardonnay, a Cabernet Franc, a cream sherry and a white port - the last two rather sweet but good as an after-dinner sip in lieu of dessert or drizzled over bread pudding or ice cream. We have a good friend who enjoys port and hoped he might enjoy the white port to add to his cellar. We got a tip on an interesting wine area to visit the next time we travel north. This time just over the border in Canada at Niagra on the Lakes. Hopefully, we will make that trip in the next year!